Life brings along with it many stories…waiting to be heard…waiting to be read. And I too have heard many real life incidents from friends, family and others. Incidents which then would linger in my mind, far too long, and take paths, far too adventurous. It was not long before I started to jolt down these stories and narrate them into an audiobook, to turn real life episodes into fiction. The whole process of masking as another character, letting loose the creative possibilities, working with music was an unforgettable learning experience. There is always something to learn from others. 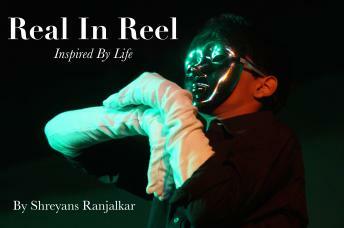 Real In Reel is all about reflections from the strange, small or big experiences of many in the most delightful manner. These stories have also had a great impact on my outlook in life. Occasionally I would find looking at my stories from a different point of view, so as to add more details and flavor to the situations and characters and, overtime I internalized these habits to my circumstances. It was not my will, but of those stories that have made themselves heard through me and led me to create this audiobook. I thank the many inspirations for this book and my father the most.